Attempts to discredit the 'Revoke Article 50 petition' are pure hypocrisy. Leavers thought they had ‘gottcha’ moment on Thursday. The only problem is – all the pro-Brexit petitions have many signatories from outside the UK. More than 23,000 signatures are from outside Great Britain or unaccounted for on the pro-Brexitpetition ‘Leave the EU without a deal in March 2019’, from dozens of countries. It secured a government response and a debate in Parliament. It’s not clear that the far-right of 4Chan followed through with these calls. But the simple fact is, some Brits sign petitions from abroad. Some people use ‘Virtual Private Networks’ to protect their privacy online, skewing the country they appear to come from. And a few non-Brits probably do slip through – the government’s e-petition site is not perfect. But attacks on the Revoke Article 50 petition are cheap – at least 1.3m people with IP addresses within Great Britain have signed it, as of early Friday. That’s a huge movement for reversing the disastrous direction the government are taking. Very cheap to set up a bot net to do this. It’s kiddie scripting stuff. The fact that you have to confirm from an email message seems to make it far more difficult for signatures to be just from bots, unlike having trolling messages. Odd that Russian IP addresses are showing up, when you need a UK IP addresses to be counted. I signed a related petition this morning. 2.8 million signatures, and an e-mail I received to confirm my e-address. How many of these are people within their 15 year Right to Vote in their last Constituency where they lived and voted before leaving for wherever they are now living and working? Obviously a lot of work required for those who would gainsay this Petition having been quite happy to accept all the chicanery associated with the actual Referendum. Am I the only person to notice that Aaron Banks Isle of Mann Office was actually in a building named after someone called Murdoch … surely that is worth finding out if there is a link there between the the two people who were extremely instrumental in bringing about the first vote result although having people taking the opportunity to ‘give him a kicking’ must bring Cameron firmly into that frame too. @nhsgp Except, as usual, you’re talking out of your arse. Jackie you are absolutely right…..the 2016 referendum gave a clear majority for leave anyone who says not does not truly understand democracy. Do people really think Gina miller and her backers who delayed everything for 6 months did not have another agenda. In any event ..there is something far more serious here than brexit (I voted to leave) the future of democracy is being challenged by ordinary people who are being swept along by the establishment who have their own agenda and reasons for ignoring the democratic vote. Forget the bots. Any foreigner can sign this without any check! I just did to see if it would work. email confirmation is required only. This petition is shared on migrant minorities fb groups as well for ‘information’ purposes as well. Leave trolls grasping at straws. The numbers of signers outside the UK is tiny in comparison to the 5.5M who have signed and many of those are bone fide citizens outside the UK. This is in sharp contrast to the conduct of the Leave campaign and the claim by May of Russian interference in UK elections (Lord Mayor’s Banquet, Nov. 2017). This has never been followed up as it would be very inconvenient for the PM’s Brexit means Brexit basis of her premiership. I can’t wait for the Leave supporters (200 allegedly marching to London as I write) to amass in London on Saturday in their hundreds of thousands! 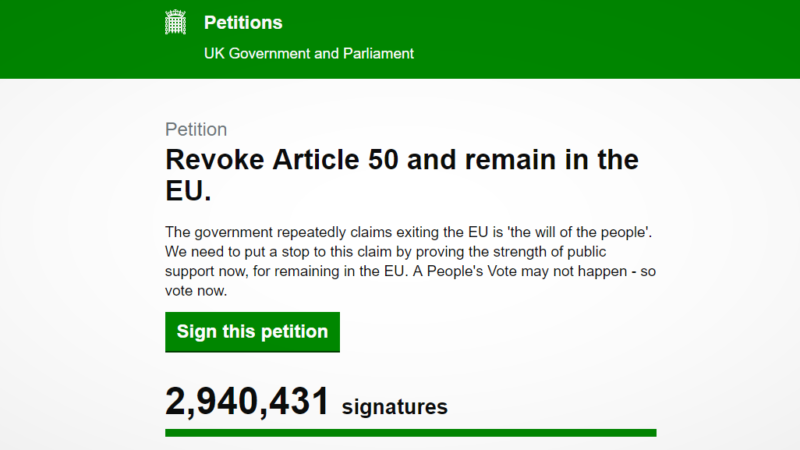 Currently, “Leave the EU without a deal in March 2019.” petition has less than 550,000 signatures or about 10% of the Revoke Article 50 petition! All this talk of “the will of the people” etc etc. Never forget, 37% of the voting population of the UK voted Leave, 35% voted Remain and the other 28% didn’t vote. That is NOT a ringing endorsement for anything. No wonder the MPs struggle to come up with a solution. The Referendum gave them no clear decision on “Brexit” , not even an agreed definition of what Brexit would look like. “The future of democracy in this country” , and “the will of the people” – both phrases that are used to frighten people into letting things happen and not challenge them. MPs have pursued the Brexit chimera in deference to the “popular will,” as manifested in the 2016 referendum; and because the interests of the two major parties seemed to exclude an honest recognition of the internal contradictions of the whole Brexit project. I wish the Left wasn’t divided and was ready to speak openly about the idiocy of trying to negotiate a “new deal” with the EU when the ‘people’ have no idea of what that deal will mean for them.